At Service Design Breakfasts (SDB) some of the best Service Design talents in Finland share their experiences and best practices. Therefore, I was very excited to see what they are all about as I took part in SDB for the first time. This time the topic was “Rapid Service Design by Co-Creating with customer SD teams”. 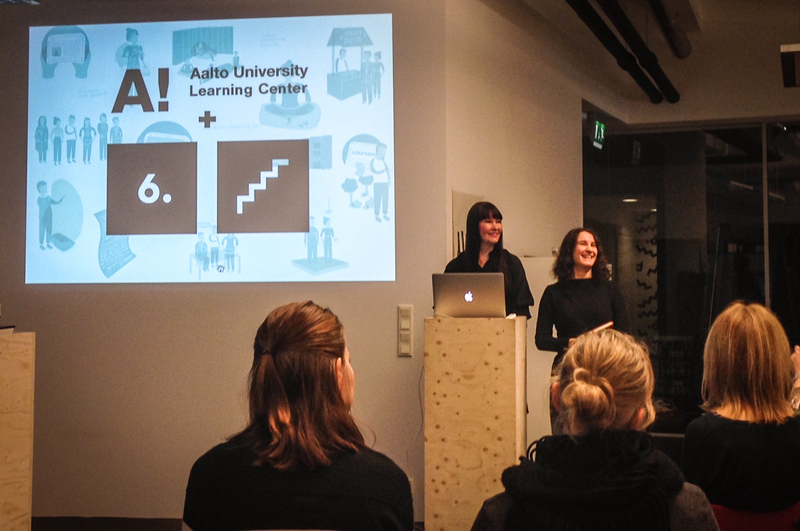 Leena Fredriksson, Service Designer from Service Design agency Kuudes Kerros, and Valeria Gryada, Designer from Aalto University Library Services, presented the project where they worked together to transform the Aalto University library to a learning center. Kuudes Kerros also participates in Service Design Achievements of the Year 2015 with this project. Leena Fredriksson and Valeria Gryada presenting the project at Service Design Breakfast. Valeria explained that there are half a million visitors yearly in the library and the way customers interact with library services is rapidly changing. There’s a change related to digitalization and new ways of learning that have emerged from that process. That’s why the library needed to carefully rethink their organization and the way they offer the services. There was a need to transform to being a learning center and they needed help with defining what the learning center actually means as a service. 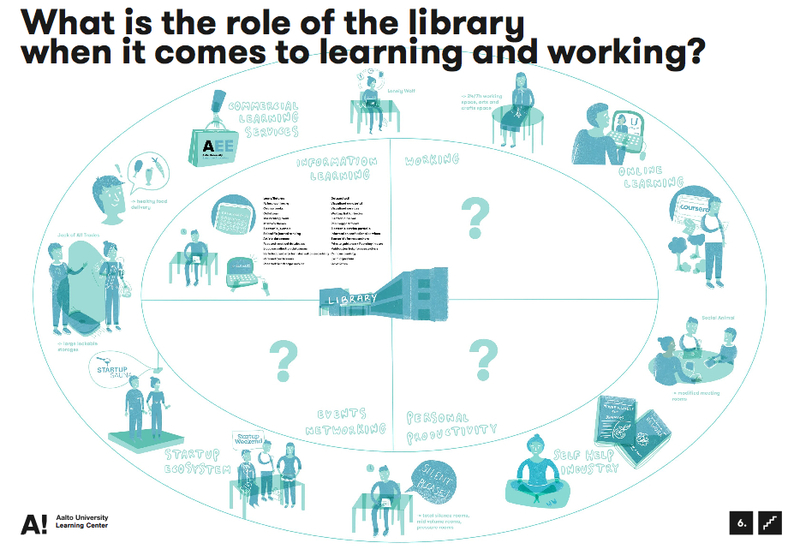 Thus, Kuudes Kerros and Aalto University Library joined forces and started to create a service design concept for a learning center. The task was to create a new holistic service concept, but there was a major challenge due to a very tight schedule of only two weeks, altogether three campuses, eight different target sectors, and everyone’s calendars mostly full. To tackle this challenge they started to recruit Service Design teams. Kuudes Kerros invited 6-8 students to join the team and the work was done in three teams of four people, lead by a Service Design professional. More precisely the teams consisted of students, researchers, exchange students, library staff and Kuudes Kerros personnel. First they had a kick-off meeting and then used brainstorming to clarify the service concept and continued by building and testing it together with the coaches. They created three on campus -teams, and all the members of the team had individual interviews, which in the end amounted to almost 200 interviews. To succeed in this co-creation effort they created a ‘project language’ to get the teams in the same page in a short time. To find the real problems they used the terms ‘headache problems’ and ‘migraine problems’. In the end they managed to create 23 new services ranging from small to large services. In addition to new services identified, the service design project helped Aalto University library to rethink their whole identity as an organization and they realized there’s also a need for new job descriptions. Another benefit was that Aalto received a set of skills from Kuudes Kerros and can now continue to develop the services further. At the moment the Learning center is still a vision and requires further development, but now it seems doable and is much more concrete than before. Before the Service Design project. After the Service Design project. It was interesting to learn how much benefits both sides can get from co-creating services and how they tackled the challenges they had. I also liked the idea of creating a common project language with the ‘headache’ and ‘migraine’ problems to really dig into user needs. For me the SDBs are a great way to learn and get insights of Service Design in practice, so I’m looking forward to take part in these events as often as I can! Before and after pictures are from the presentation, please find the presentation and more information about the project here.